Plot: Spider-Man crosses parallel dimensions and teams up with the Spider-Men of those dimensions to stop a threat to all reality. Starring: Nicolas Cage, Hailee Steinfeld, Jake Johnson, Liev Schreiber. 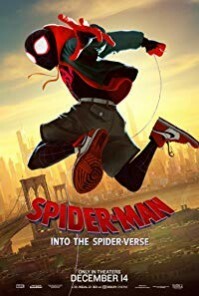 distributed by Sony / Columbia «Spider-Man: Into the Spider-Verse» in the US movie theaters released on December 14, 2018 and has grossed over $353 million worldwide; dvd and blu-ray release date was set for March 19, 2019. Rent from Netflix and Redbox from March 19, 2019. «Spider-Man: Into the Spider-Verse» in the UK released in movie theaters on December 14, 2018. The movie released on dvd and blu-ray on April 22, 2019.